B52 is a Anodized aluminum railing with a steel look with long durability and easy maintenance. Include 1 Handrail 7 ft x 1.97″, 3 Brackets, 2 Handrail End Cover, 6 self-drilled screws and 1 Notice. Screws for the wall support brackets are not included. B52 is a Anodized aluminum railing with a steel look with log durability and easy maintenance. Include:2 Handrail x 1.97″ ( 14 FT ), 1 Aluminum Connector ,5 Brackets, 2 Handrail end Cover, 10 self-drilled screws. Screws for the wall support brackets are not included.”Handrail longer than 9 ft. are shipped in 2 pieces with a connector”. B52 is a Anodized aluminum railing with a steel look with log durability and easy maintenance. Include:1 Handrail 8 ft x 1.97″, 4 Brackets, 2 Handrail end Cover, 8 self-drilled screws and 1 Notice . Screws for the wall support brackets are not included. B52 is a Anodized aluminum railing with a steel look with log durability and easy maintenance. Include:2 Handrail x 1.97″ ( 15 FT ), 1 Aluminum Connector ,5 Brackets, 2 Handrail end Cover,10 self-drilled screws. Screws for the wall support brackets are not included.”Handrail longer than 9 ft. are shipped in 2 pieces with a connector”. B52 is a Anodized aluminum railing with a steel look with log durability and easy maintenance. Include:2 Handrail x 1.97″ ( 16 FT ), 1 Aluminum Connector ,7 Brackets, 2 Handrail end Cover,14 self-drilled screws. Screws for the wall support brackets are not included.”Handrail longer than 9 ft. are shipped in 2 pieces with a connector”. B52 is a Anodized aluminum railing with a steel look with log durability and easy maintenance. Include:2 Handrail x 1.97″ ( 12 FT ), 1 Aluminum Connector ,5 Brackets, 2 Handrail end Cover, 10 self-drilled screws. Screws for the wall support brackets are not included.”Handrail longer than 9 ft. are shipped in 2 pieces with a connector”. B52 is a Anodized aluminum railing with a steel look with long durability and easy maintenance. Include 1 Handrail 6 ft x 1.97″, 3 Brackets, 2 Handrail End Cover, 6 self-drilled screws and 1 Notice. Screws for the wall support brackets are not included. B52 is a Anodized aluminum railing with a steel look with log durability and easy maintenance. 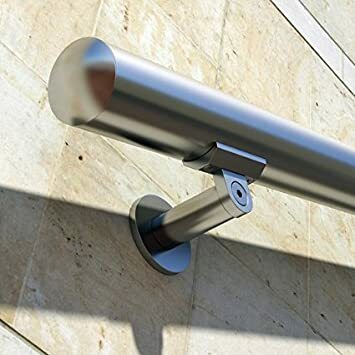 Include:2 Handrail x 1.9″ ( 9FT ), 1 Aluminum Connector ,4 Brackets, 2 Handrail end Cover, 8 self-drilled screws. Screws for the wall support brackets are not included.”Handrail longer than 8 ft. are shipped in 2 pieces with a connector”. B52 is a Anodized aluminum railing with a steel look with log durability and easy maintenance. Include:2 Handrail x 1.97″ ( 11 FT ), 1 Aluminum Connector ,5 Brackets, 2 Handrail end Cover,10 self-drilled screws. Screws for the wall support brackets are not included.”Handrail longer than 9 ft. are shipped in 2 pieces with a connector”. B52-Round 5Ft B52 Anodized Handrail Aluminum Stairs Kit Stainless Steel Look 5 Ft and 1.97 "diameter(round)-includes 3 Wall Brackets and 2 Railtop End Covers. B52 is a Anodized aluminum railing with a steel look with log durability and easy maintenance Include:1 Handrail 5 ft x 1.97″, 3 Brackets, 2 Handrail end Cover, 6 self-drilled screws and 1 Notice . Screws for the wall support brackets are not included. B52 is a Anodized aluminum railing with a steel look with long durability and easy maintenance. Include 2 Handrail x 1.97″ ( 10 FT ), 1 Aluminum Connector,5 Brackets, 2 Handrail End Cover, 10 self-drilled screws. Screws for the wall support brackets are not included.”Handrail longer than 9 ft. are shipped in 2 pieces with a connector”.